There’s a ton of new Staples in-store and online deals waiting for you this Monday morning. 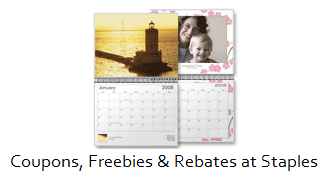 Grab some freebies, use some Easy Rebates, and check out all the new Staples printable coupons! Head over to Staples Facebook page and get your FREE 8.5″x11″ Photo Calendar. Send your calendar to the nearest Staples for FREE in store pick up. Log in to your personal Facebook account when ordering to choose which friends birthdays and profile pictures will show up on your calendar! Grab 500 sheets of Hammermill Copy Plus Paper for FREE! Staples easy rebates come back in the form of a Visa gift card that you can take anywhere. This is actually better than their store rewards that have to used on future purchases at Staples. It will take about 4-6 weeks to get your rebate. See more deals from office supplies stores.